Here comes an OLD entry from my archive, when I say Old, it is really old, the pic was taken around 2011. As u see, all the pics are over exposed and so I din't wanna post, but it's ok, everybody learns from their mistakes, take a peep and pour in ur views ppl..This recipe is adapted from Chef Harpal Singh, o god, I just simply love his recipes, his way of explaining things, he would not miss even a single detail that is tremendous. As usual his recipe rocks..
Clean and pat dry the chicken pieces. Make several slits on the chicken flesh everywhere from the top to the bottom. Add the chicken pieces to a wide bowl and start adding the ingredients for the first marination, salt, Kashmiri red chilli powder, ginger garlic paste and finally the lemon juice. Mix them well with the chicken esp the masala in between the slits as well. Cover with a cling wrap and marinate in the fridge for an hour or so. In the mean time, add one cup of yogurt to a thin muslin cloth and tie it closely. Hung them for an hour so that all the water comes out and becomes thick. Now it's time for the second marination. Take a wide bowl, add the hung yogurt, salt, kashmiri red chilli powder, garam masala powder, black salt, mustard oil( add mustard paste + sunflower oil if oil not available). Combine the masala well using a spoon and make a thick marination. Take the already marinated chicken and dip them in the second marination. Cover the chicken pieces with the second marination everywhere. Marinate all the pieces. Cover the bowl again and keep inside the fridge over night or at least 2 to 3 hrs for good marination. Turn on the oven to its maximum temperature settings ( 500 deg F), when u r ready to bake, line the baking with aluminum foil and place the chicken pieces one by one, shaking off the excess masala in case it is too much. Place the tray in the middle of the oven , close it and cook for 15 minutes. 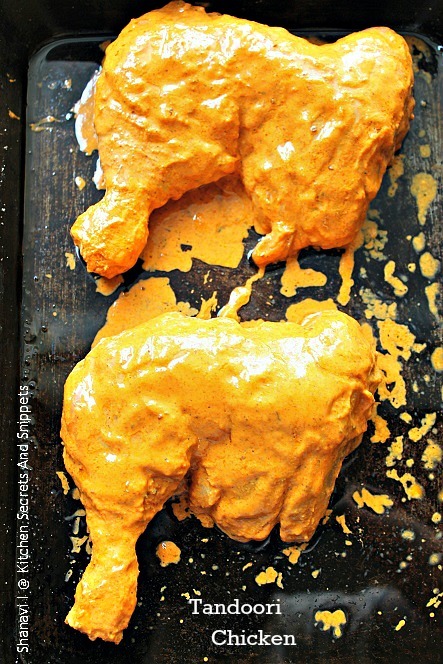 Take the tray out carefully wearing oven mitts and baste the chciken pieces with the butter on top. Again put it inside the oven and cook for another 10 minutes. Later turn the settings to BROILER mode , bring down the temperature to 350 deg F and broil the chicken pieces for 2 to 3 minutes, to get that grilled effect. Serve hot with mint chutney or simply with raita. 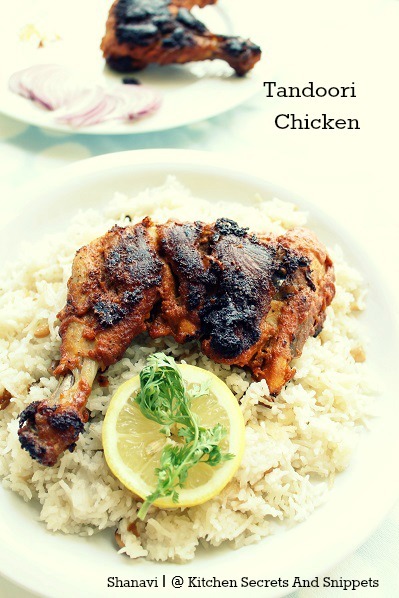 Do not forget to shake off the excess masala dripping from the chicken pieces. Always marinate the chicken more to get the best out of it, else at least allow 1 to 2 hrs of time before cooking. I've added mustard paste and sunflower oil as I don't store mustard oil. 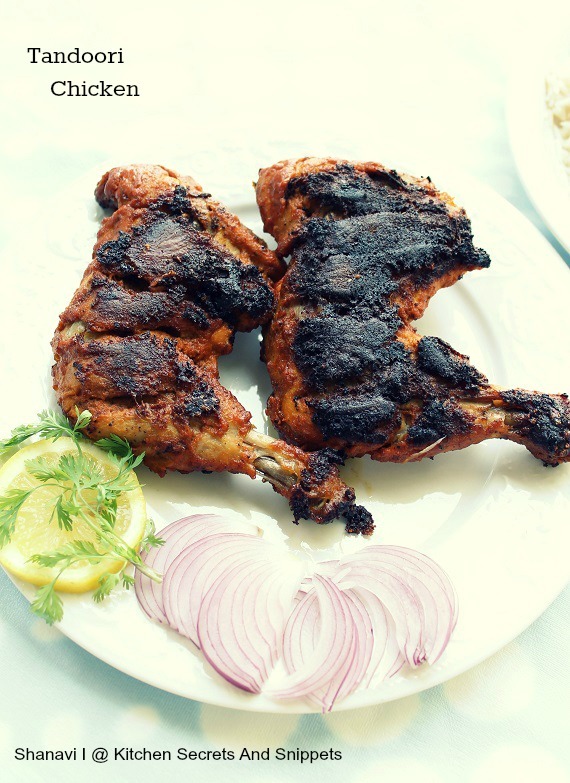 Tandoori chicken looks inviting and yummy. Perfectly baked. love the 2nd click,absolutely gorgeous,love to have them with nan. 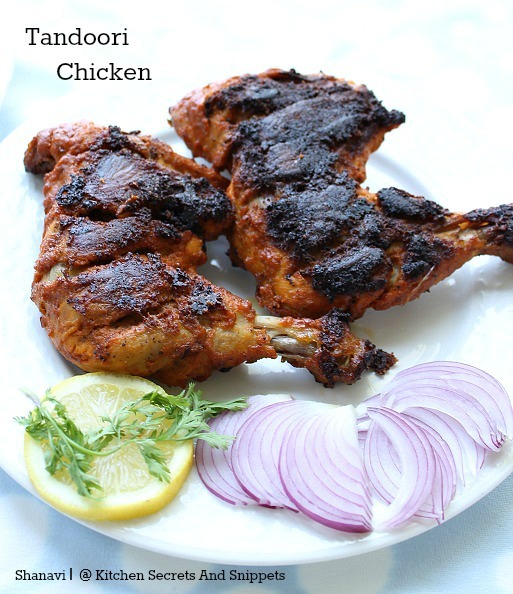 Wow Shanavi...Love your version of Tandoori Chicken!! the chicken looks crispy and juicy!! 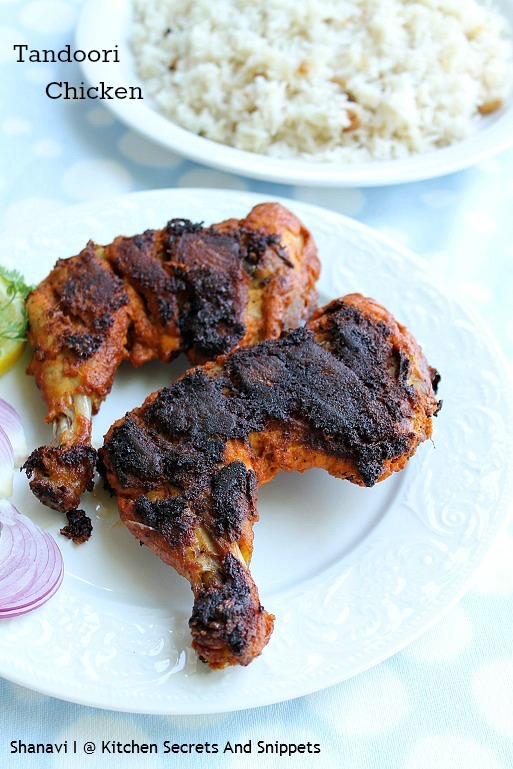 My mouth is watering ..
Dont tempt me like this..Very droolworthy tandoori chicken..just torturing me. Thanks for visiting my blog dear. I'm very happy to follow you.